Owning a beer, wine, or liquor store, you may often wonder what else you can sell to make a little more profit. Depending on your state and/or local laws, you may be able to sell additional items such as grocery or gift. If you are one of the lucky ones that can sell other items besides alcohol, here is a short list to get you started. One of the top things you should be selling in additional to liquor is the mixers. Think sodas (aka pop, or coke), tonic/soda water, juice, margarita mix, bloody mary mix, ice, and more. 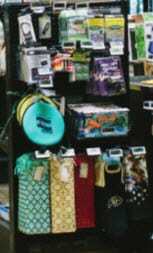 A couple more great items that can compliment the purchase are koozies for your beer consumers and wine stoppers for your wine consumers. One thing you can bet on is someone is purchasing an item as a gift. This is typically a nice bottle of wine or an expensive liquor. You should keep items on hand for the last minute shoppers such as gift bags and tissue paper. If you are near a college town, this is an easy sell. Think of the drinking games beer pong and flip cup. Keep red Solo cups and ping pong balls on hand. Also other party supplies like dice and cards should sell well. There are two categories of grocery items. The first is snack items and the other is specialty items. Snack items should include things like chips, candy, and peanuts. Easy to grab and go. Specialty items are going to include your specialty meats and cheeses that most consumers will choose to go with a nice bottle of wine. There are a lot of great items you can sell to compliment what you are already selling. Think of items that your consumers would purchase and try them out. The worst thing that can happen is you don’t order that product again. See our blog post about Food Pairing Promotion Ideas and Display Ideas to get some additional ideas.